I learnt today that SB7 Mobile have reported several of my tweets to Twitter as being illegal. We are writing to inform you that Twitter has received official correspondence regarding your Twitter account, @Payforit_Sucks. Twitter has not taken any action on the reported content at this time. We are only writing to inform you of content posted to your account which has been mentioned in a complaint. We may be obligated to take action regarding the content identified in the complaint in the future. Please let us know by replying to this email as soon as possible if you decide to voluntarily remove the content identified on your account. Thank you for informing me about this complaint. I have reviewed the tweets in question and cannot see that they break any UK or EU laws. They do serve to highlight widespread legitimate complaints about the company (SB7 Mobile) which I assume made the complaint. This company has been seeking to stifle valid and justified criticism both on Twitter and on Trustpilot. It is the nature of a platform like Twitter that such criticism will be made, and the normal response is for the company to answer the criticism, not to try to get the criticism removed by claiming it is illegal. I would be interested to know the reasons supplied by the complainant for these tweets being illegal. I therefore do not propose to voluntarily remove these tweets, or to desist from posting further tweets of a similar nature. However, I have no wish to cause problems for Twitter or to be in any way unreasonable. I understand that you have to protect Twitter’s interests, and if, after review, you hold these tweets to be illegal I will voluntarily remove these and a number of similar tweets which have not yet been reported. 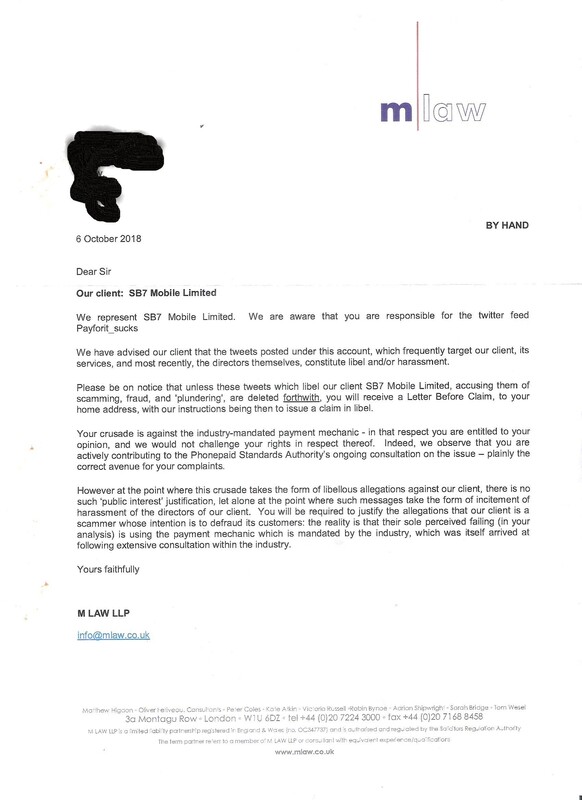 Tonight I received a solicitors letter from SB7 Mobile Ltd. I think they took exception to me identifying that the home addresses of the directors could be found on a document at Companies House. Let me clear, I would not condone harassing the directors, but consumers may wish to send them copies of correspondence sent to the company, in particular, letters before action in the Small Claims court. There is much legitimate criticism, and I would much prefer SB7 Mobile Ltd to answer these criticisms rather that try to stifle them. My problem is not just with the industry-mandated payment mechanic. It is to do with the way that certain companies are exploiting the vulnerabilities of this mechanic to take money from vulnerable consumers. Well I have liked and retweeted the lot! Looks like these guys are getting serious. This social media exposure is hurting them. Yes, the complaint to Twitter came as a bit of a surprise, but I am optimistic that they will not remove my tweets. In the meantime your support is greatly appreciated. The criticism seems to be hurting them, but there is no sign yet of a change in behaviour. If they really didn’t intend to scam consumers, I would expect them to be refunding much more readily in cases where consumers deny consenting to the service and haven’t used it.